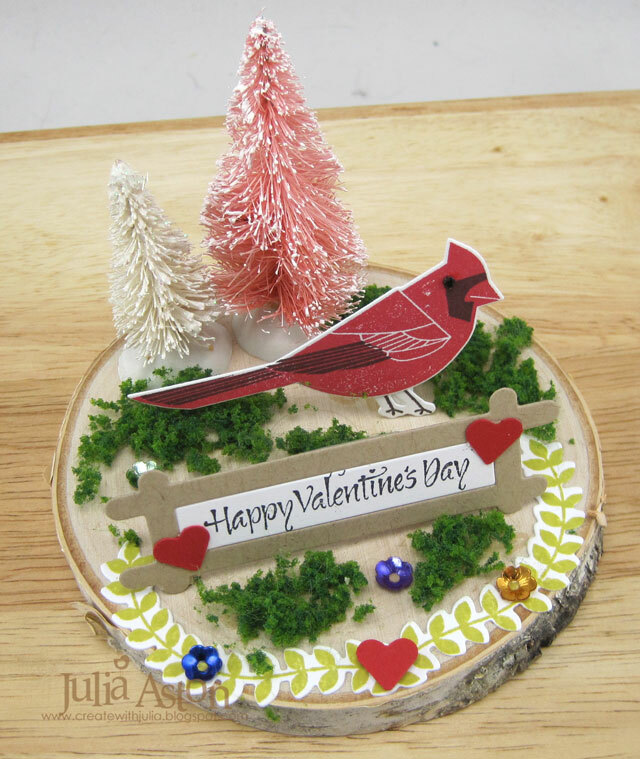 I made this little birch coaster Valentine decoration for a friend at work to give to her 88 year old mother who lives up in Maine. She loves to watch the birds in her backyard and also likes to display decorations like this on her kitchen window sill. 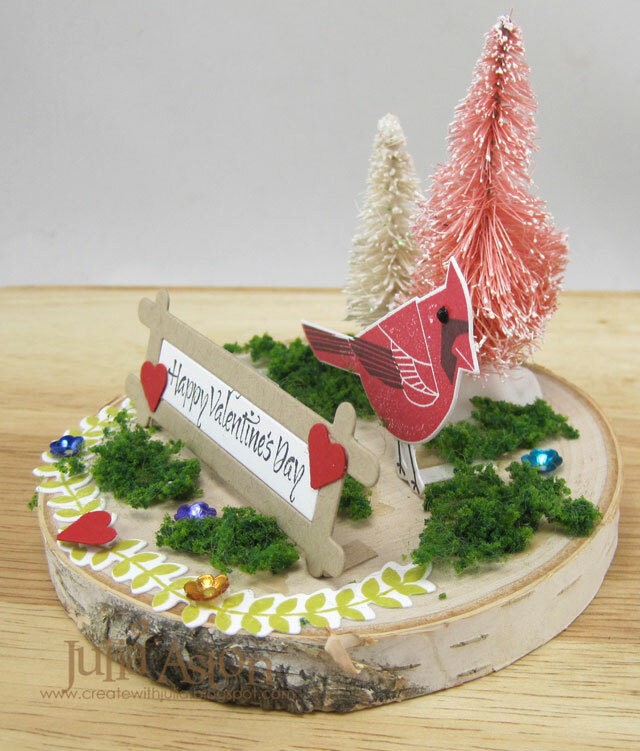 The birch bark coaster and little bottle brush trees are from Joann's. I thought this Outlined die from PTI looked rather like a little garden fence cut from Kraft card. I stamped the sentiment on white and taped it to the back of the die cut. I added little tabs to the side posts of the die and glued that to the wood coaster. The cardinal was die cut and stamped using Winter Woods from PTI. I added a little tab to the birds feet and glued it to the wood. The garland die and stamp are from Wee Folk Mini Market from PTI. I punched little hearts to add to sign and base and also glued green foliage clusters and flower sequins to the base. My friend can write a note to her mother with a fine tip marker on the bottom of the wood coaster. The wood coaster is about a 3 1/2" in diameter, so it makes a sweet little decoration that will fit on a window sill or small shelf quite nicely! Winter has finally arrived here in Massachusetts - we had a snowstorm on Friday, another one on Monday - and are having pretty light flurries today with cold and more snow predicted for the weekend! 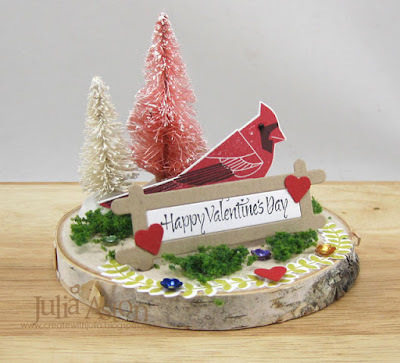 Stamps: Winter Woods, Wee Folk Mini Market - Papertrey Ink, Happy Valentines Day - unknown from stash. Accessories: Dies - Outlined Dies, Cardinal from Winter Woods, Garland from Wee Folk Mini Market Kit - PTI, foam dots, Scotch Quick Dry Adhesive, Foliage Clusters/Wee Scapes, tiny heart punch - McGill, Bottle Brush trees and Birch coaster - Joann Fabric. Wow!! This is really awesome, Julia! Beautiful project and great detail!! Thank you for joining us over at Decorate to Celebrate! Wow! That is so creative and so cute Julia! You are too clever! You have made a great project!!. Thank you for joining us at Artistic Inspirations! Good Luck and hope to see you again. Such a sweet gift that I 'm sure will be treasured and bring a smile to the ladies face every time she see's the cute little bird. Really adorable - what a perfect gift for your friend's mother - I'm sure she will cherish it. Cardinals just make you happy, don't they? Great use of the stamp and die from Papertrey Ink. I adore that cardinal! And the clever little fence...wonderfully creative! What a sweet gift for your mom, Julia!